Because cosmetic surgery procedures are almost always elective surgery on the part of the patient, these types of cases are more difficult to litigate in front of a jury panel. Why? Because many jurors opine that in many cases, cosmetic surgery procedures are elective procedures to improve one’s appearance and not medically necessary or life- saving procedures. As such, when something goes wrong during these types of procedures, jurors scrutinize the case a little more, because many feel the patient put themselves into the situation by electing to have the procedure done when it may not have been medically necessary. Nonetheless, cosmetic surgery whether elective or not, shall still be taken seriously and when medical care during these procedures go wrong there can be serious life threatening results. Because Florida law allows doctors to practice medicine without any malpractice insurance, Florida, and specifically South Florida, has become the mecca for botched plastic surgery cases. Because many of these procedures are done at small outpatient facilities or in the plastic surgeon’s office, when an emergency arises, often times the facility itself does not have the necessary medical equipment to deal with emergency situations. Precious time is lost during an emergency when the office staff has to contact an ambulance to transport the patient to a local emergency room of a nearby hospital in order to get the emergency care that patient needs. Because every minute counts during an emergency, a delay in receiving timely care usually results in additional risk and permanent injury to the patient and in rare circumstances, death. A serious aspect in cosmetic procedures is the use of anesthesia for surgery. As a patient, you should pay close attention to the training and experience of the person who will be administering the anesthesia to you prior to any cosmetic procedure. You should ask whether they are doctor anesthesiologists or whether they are nurse anesthetists. You want to be sure that the person who will be responsible for managing your airway, breathing and circulation during your procedure is well trained and experienced. If a complication were to arise during your procedure, you want someone there who knows how to provide you with the timely medical care needed. There are a number of hypoxic ischemic injuries that result from patients being improperly monitored during their procedures and many result in permanent long term neurological damage. Permanent disfigurement and scarring may be an unfortunate consequence of an unexperienced surgeon. When undergoing elective cosmetic surgery your goal is to come out looking and feeling better about yourself. However, sadly there are times when the surgeon just doesn’t have the experience or ventures into other types of procedures he may not have received the proper education, training or experience in and you come out of surgery looking like you were attacked by a pit bull. That’s because Florida’s doctor-friendly laws allow any licensed medical doctor to perform plastic surgery even if they are not trained or qualified as plastic surgeons. Another concern in cosmetic procedures is the lack of concern on the part of the surgeon regarding a patient’s prior medical history and any medical condition or co-morbidities that patient may have prior to the procedure (eg. high blood pressure, cardiac related issues, diabetes, or other serious medical conditions). 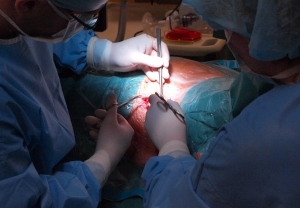 Many surgeons fail to take into account the heightened risks associated with a patient’s co-morbidities and proceed with allowing that patient to undergo an invasive procedure under general anesthesia. The risk and benefit ratio are often not properly considered by surgeons and many of these physicians place their patients life and health at risk so that they can gain from the financial expense of the cosmetic procedure. The lawyers at Halberg & Fogg PLLC have assisted individuals and families that have been injured as a result of medical malpractice for over 40 years. If you or a loved one has been injured, it is important to contact a qualified and knowledgeable attorney who can help you, and your family, recover the compensation that you deserve. The lawyers at Halberg & Fogg PLLC. have years of experience handling these types of cases and are willing to speak to you at any time for a free consultation.